Siberian Motherwort, Leonurus sibericus, is the source of Chinese medicinal remedy Yi-mu-cao. Energies blood and regulates menstruation. Excellent long lasting cut flowers. Lithe stems with red-purple racemes. Siberian Motherwort is native to Siberia, Mongolia and China. Adaptable to most soils in a sunny to part-shaded position. Frost and drought tender. An annual or biennial plant, growing to 2m x 1m. 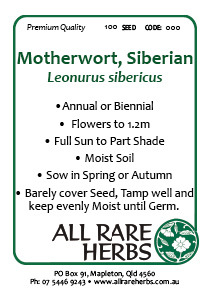 Be the first to review “Motherwort, Siberian seed” Click here to cancel reply.